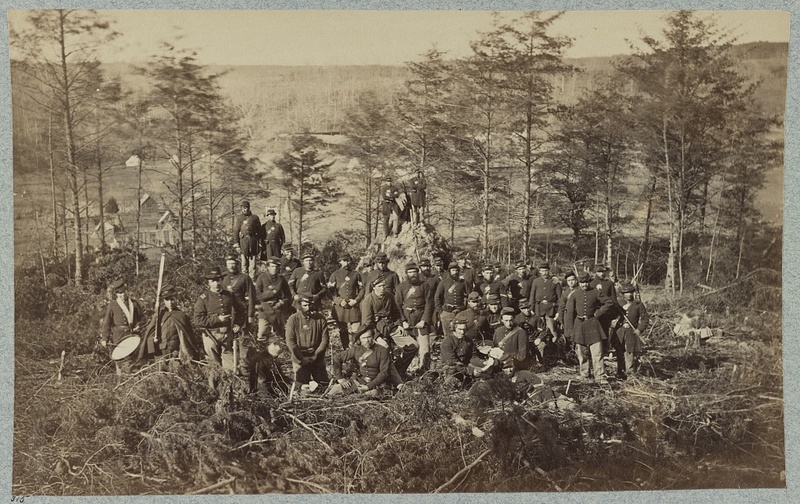 This is the first in a new series of posts on the site which seeks to tie surviving American Civil War objects to the stories of those people associated with them. 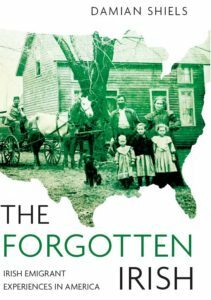 Surviving objects from the Civil War era are tangible links to the past- they served as ‘witnesses to history.’ I have long been fascinated by the ability that objects have to guide our hand in uncovering the stories of past peoples, while simultaneously increasing our affinity and sense of connection with those who came into contact with them. Now, thanks to my good friend and Civil War expert Joe Maghe, we have an opportunity to explore some of the remarkable objects from Joe’s collection on the site. 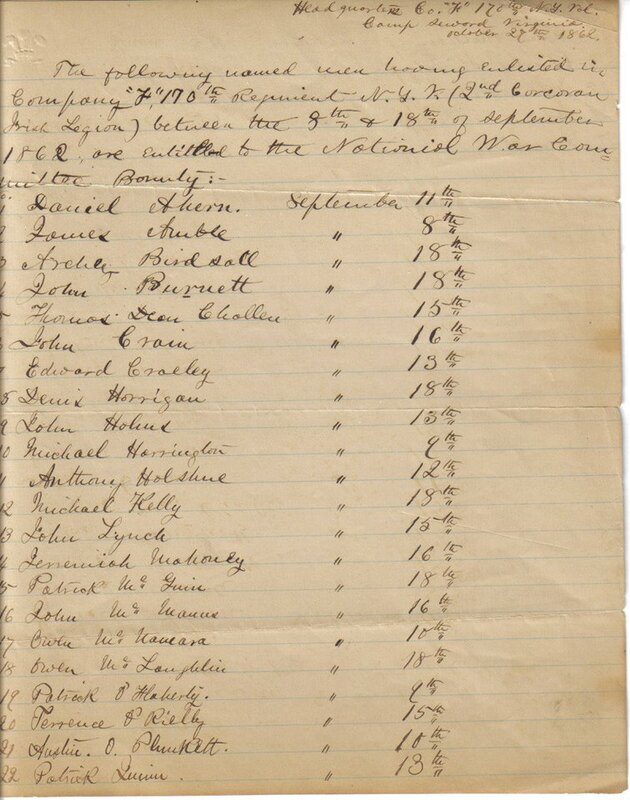 This first instalment examines a document which lists a small group of men in Corcoran’s Irish Legion, providing a snaphshot of the 170th New York Infantry in October 1862 and allowing us to ask, what was their fate? A document such as this offers us the opportunity to examine what became of each of these men- who survived, who deserted, who was maimed or killed in the years to come? Using a combination of the rosters of the 170th New York, the Civil War Veterans Pension Index Cards, a selection of Widow’s Pension Files and Joe’s previous work on the document, I have sought to flesh out some details of their lives in the army, and for a small number of them reveal something of they and their family’s pre and post-war experiences. 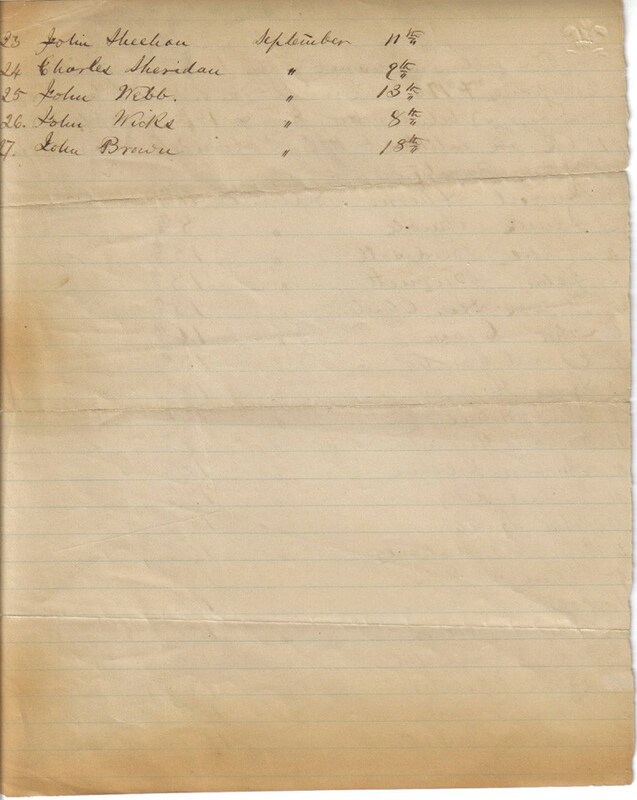 Each man is listed below in the same order in which they appear on the original document. The 42-year-old enlisted on 11th September 1862, mustering in as a Private in Company F. He was captured at the North Anna on 24th May 1864, dying of diarrhoea on 31st July 1864 at Andersonville, Georgia. Daniel’s widow received a pension for his service from 23rd June 1865. The 29-year-old enlisted on 8th September 1862 and became a Private in Company F. He was wounded in action at the Landron House on 18th May 1864 an engagement in which he lost his arm. He was still absent wounded in Central Park Hospital, New York when the regiment mustered out in 1865. The 18-year-old enlisted on 18th September 1862, becoming a Private in Company F. He deserted on 1 November 1862 at Camp Seward, Arlington Flats, Virginia. The 43-year-old enlisted on 18th September 1862 and became a Private in Company F. When he was mustered out on 17th July 1865 he was in hospital in Alexandria, Virginia. John received an invalid pension based on his service from 22nd May 1876 and following his death a pension for a minor child was also claimed. The 23-year-old enlisted on 15th September 1862. Initially a Private in Company F, he was promoted to hospital steward on 24th April 1864, and mustered out with the regiment near Munson’s Hill, Virginia on 15th July 1865. The 19-year-old enlisted on 16th September 1862. A Private in Company F, he was wounded on 24th October 1864, but recovered to be mustered out with his company near Washington D.C. on 15th July 1865. The 42-year-old enlisted on 13th August 1862. He served as a Private in Company F. When he mustered out on 27th July 1865 he was in Armory Square Hospital, Washington D.C. He sought an invalid pension based on his service on 4th March 1871 but this appears to have been rejected. The 28-year-old enlisted on 18th September 1862, serving as a Private in Company F. He was mustered out with his company on 15th July 1865 near Washington D.C. He received an invalid pension from 22nd November 1890. The 40-year-old enlisted on 13th September 1862, and became a Private in Company F. He was listed as a deserter following the expiration of a furlough on 24th March 1864 at Devereaux Station, Virginia. The 36-year-old enlisted on 9th September 1862 and became a Private in Company F. He was killed in action at the North Anna on 24th May 1864. Michael’s widow Mary (née Mahon) received a pension from 2nd September 1865. She lived at 57 Baxter Street in New York and listed her age as 50 when she first applied for the pension in 1864. The couple had been married in St. Peter’s Catholic Church, New York on 7th January 1856 by the Reverend Mr. Quinn. When Michael died he left one child, Catherine, who had been born in the late 1850s. The 40-year-old enlisted on 12th September 1862 and served as a Private in Company F. He died of paralysis at Suffolk, Virginia on 12th February 1863. He was said to have contracted the paralysis while on picket duty that January, a result of severe hardship and fatigue. Anthony’s widow Sophia (née Bertsch) received a pension dated from 23rd July 1863. Anthony (the correct spelling of his name was Anton Holzschuh) was originally from Niederhofen in Württemberg, while Sophia was from Eberstadt, also in Württemberg. His death left the family ‘helpless’, leaving only his ‘old uniform cloths’ and a likeness of his young son behind. The couple had been married on 23rd April 1855 at the German Universial Christian Church in New York; Sophia had travelled from her home in West-Hoboken for the ceremony to marry Anton, who was a widower. It seems likely Anton had lied about his age to enlist in 1862; his marriage record of 1855 records his age as 43, suggesting he was more likely 50-years-old upon enlistment. Sophia was living in Hudson City, New Jersey when she applied for the pension in 1863, at the age of 32. The couple had two surviving children in 1863- Sophia (aged seven and born 31st December 1855 in Hoboken) and John (aged five). John did not long outlive his father, dying in New York on 5th February 1866 at the family home of 261 Avenue A in New York. The 21-year-old enlisted on 18th September 1862, becoming a Private in Company F. He was wounded in action at Petersburg on 22nd June 1864 and never returned to his company. He was absent sick when it mustered out in 1865. The 37-year-old enlisted on 15th September 1862 and initially served as a Private in Company F. He was promoted to First Sergeant on 7th October 1862, Second Lieutenant on 1st February 1863 and First Lieutenant on 10th April 1863. John was discharged from service on 5th October 1863. The 18-year-old enlisted on 16th September 1862, becoming a Private in Company F. He was wounded in action at Petersburg on 16th June 1864, never returning to his company. He was absent in hospital when they mustered out in 1865. He filed for a disability pension resulting from his service on 12th February 1866 which was granted. The 43-year-old enlisted on 18th September 1862 and became a Private in Company F. He was reported missing in action at the Battle of Ream’s Station on 25th August 1864, returned from hospital and was transferred to the 129th Company, 2nd Battalion of the Veteran Reserve Corp on 1st January 1865. He was discharged for disability at Finley Hospital, Washington D.C. on 3rd March 1865. Patrick died on 14th October 1875 and his widow claimed a pension based on his service from 21st July 1890. The 45-year-old enlisted on 16th September 1862 and became a Private in Company F. He was recorded as deserted on 24th March 1864 at Union Mills, Virginia, having never returned at the expiration of a furlough. The 43-year-old enlisted on 10th September 1862 and became a Private in Company I. He deserted on 9th October 1862 at Camp Scott, Staten Island, New York Harbor. The 31-year-old enlisted on 18th September 1862, becoming a Private in Company F. He was wounded at the Battle of the North Anna on 24th May 1864 and again at the Battle of Ream’s Station on 25th August 1864. He never returned to his Company, and was recorded as absent wounded in hospital at muster out in 1865. However, it appears he had in fact died of his wounds; a widow’s pension was filed but rejected on 14th December 1864 but a subsequent minor child’s application was granted. The 38-year-old enlisted on 15th September 1862, becoming a Private in Company F. He died of cholera on 19th September 1863 at Centreville, Virginia, having first taken sick while on picket duty. His 41-year-old widow Mary (née Cooney) successfully applied for a pension on 19th December 1864 from her home at No. 385, Second Avenue in New York. The couple had been married by the Reverend Matthew McQuade at Kill, Co. Cavan on 17th February 1846. They emigrated soon afterwards, as their daughter Catharine had been born in New York on 10th April 1847, and baptised in the Church of the Nativity on Second Avenue. A second daughter, Mary-Ann, was born around 1852 but did not survive to adulthood. Mary was described as a ‘poor woman with a sick child’ in 1866. The 21-year-old enlisted on 10th September 1862, initially becoming a Private in Company F. He was promoted Sergeant to date from 10th September 1862 and Sergeant-Major on 10th June 1864. Augustin actually assisted as a Sergeant in recruiting a number of other men on the list in September 1862, including Terrence O’Reilly. Augustin was wounded at the Battle of Ream’s Station on 25th August 1864, and was retransferred to become a Private on 20th November 1864. He was thereafter absent from his company, serving in the quartermaster’s department at City Point, Virginia from 21st November 1864. Augustin was discharged as a Sergeant-Major on 28th July 1865 in New York City. He applied for pensions on 19th June and 26th February 1907 and was credited with additional service in the Navy. He died on 3rd February 1932. The 42-year-old enlisted on 13th September 1862 and became a Private in Company F. He was reported missing in action at the Battle of North Anna on 24th May 1864 and was subsequently absent in hospital, where he remained at the muster out of the company in 1865. The 43-year-old enlisted on 11th September 1862. A Private in Company F, he was captured in action on 25th August 1864 at the Battle of Ream’s Station. John died while a Prisoner of War on 20th September 1864 at Andersonville, Georgia. A minor pension was granted based on his service following an application by Dennis Sheehan on 25th June 1866 from No. 167, Seventh Avenue, New York. John Sheehan had been married to his wife Ann (née Callaghan) in Co. Limerick by the Reverend Father Burke on 25th November 1835. Ann contracted meningitis and died at the age of 41 in Bellevue Hospital on 21st September 1863, while her husband was in the service. She was buried in Calvary Cemetery. When John died a Confederate POW the following year, it left their children orphaned. Of the couple’s six children (Joseph, Margaret, Mary, Dennis, Anne and Michael) two were minors when John died. These were Michael, born on 28th September 1856, and Anne, born on 31st July 1860. It was their elder brother Dennis, aged 22 in 1866, who took the two minors in and applied for the minor pensions in their name. The 23-year-old enlisted on 9th September 1862. He was promoted to Corporal in Company F on the same day of his muster in on 7th October 1862, and became a Sergeant on 1st July 1864. He was returned to the ranks on 20th June 1865 prior to mustering out with his company on 15th July 1865 near Washington D.C. He was later granted an invalid pension based on his service, having applied on 17th January 1881. The 26-year-old enlisted on 13th September 1862. A Private in Company F, he was wounded in action on 3rd June 1864 at the Battle of Cold Harbor. John was subsequently transferred to Company F of the 19th Regiment, Veteran Reserve Corps on 24th January 1865. He mustered out on 4th August 1865 at Buffalo, New York. The 22-year-old enlisted on 8th September 1862. A Private in Company F, he was promoted to Corporal at a date prior to 10th April 1863. John was captured at the Boydton Plank Road on 27th October 1864, and died a Prisoner of War at Richmond, Virginia on 15th February 1865. Three men in the regiment bore the name John Brown, all of whom enlisted in September 1862 and all of whom served in Company F. This one is the 32-year-old John Brown, who deserted on 14th October 1862 from Camp Scott on Staten Island, New York Harbor. **This series of posts is only possible thanks to the generosity of my good friend Joe Maghe. Joe’s dedication to preserving objects relating to the Irish experience of the American Civil War is exceptional and is matched by his knowledge regarding the men who once possessed them. Thanks to his efforts a huge swathe of material relating to the Irish of the American Civil War has been made available to those researching the conflict. Well done, Damian. I applaud your work & expertise… you continue to amaze us with your detailed work. May you continue to do so. What very interesting personal information you have been able to find regarding these service men’s lives both before and after the war. It adds so much to their memories and their life stories. Thanks Joe- and thanks for sharing your incredible material with us! Many thanks for that I will include it with his name- as with the Irish surnames many German surnames were variously recorded (usually incorrectly!) during this period. I hope in the coming weeks to have another Gernam story of the site, relating to the letters of a German soldier who also served in Corcoran’s Irish Legion. Any idea what the bounty was? Good question I am not sure what it was at this stage, but I must check. Given previous reading I would be surprised if it was very high, I have seen figures of $40 and $60 mentioned for this period- the days of extremely high bounties were still in the future (though I stand to be corrected in this instance!). From the September 10, 1862 New York Times. In consequence of the difficulty about certificates for the State bounty, which originated in the office of Dr. THOMSON, (the Medical Inspector appointed by Gov. MORGAN,) there were not so many applicants yesterday morning, as usual, for the premiums offered to recruits. As soon as Col. REEVE, had settled the matter, however, recruiting officers, with the men they had enlisted, began to pour in, in greater numbers than ever. Capt. CARR had his hands full attending to the disbursement of the United States bounty, but got through his work with his accustomed ease and rapidity. Recruiting officers were busy making out the necessary papers for procuring the State bounty from Col. BLISS; but, of course, the money does not come on for a day or two. The liveliest place of all,though, was the Comptroller’s office, back of the Hall of Records, where a crowd was collected all day,partly consisting of volunteers, calling to receive the$50 City bounty, and largely of an interested crowd anxious to see how the sudden receipt of so much money made a man look and act. Brilliant Joe, thanks for sharing this! This committee met yesterday afternoon in the rooms of the Chamber of Commerce. Resolved, That the Treasurer be and he is hereby directed to draw his check in favor of Hon. CHARLES F. DALY, Treasurer of the Corcoran Committee, for all moneys in his hands which were especially subscribed to the Corcoran Legion. Resolved, That of the funds in the hands of the Committee, $3,000 be reserved for future demands, and that the balance be appropriated, so far as will go, or may be required, to the payment of a bounty of $50 to each resident of this City who will enlist in the Corcoran Legion or any other regiment recruiting in this City within the next ten days; and that the money be paid in regular order, as the vouchers of enlistments are furnished to the Treasurer, so long as there may be money on hand. NY Times Published: September 3, 1862 The payment of the State and United States bounties is going on the same as ever. The former will continue to be paid to recruits for new regiments up to Saturday, and to recruits for regiments in the field until further notice. No period has been fixed for the stoppage of the latter. Col. BLISS forwards cheeks for each man’s share of the Stats bounty as soon as he can, after receiving the requisite papers from the man’s company officer. Capt. CARR dispenses the United States bounty at once, without any needless delay or circumlocution. The bounties hitherto to paid are to be still further increased, from an appropriation made by the Common Council, to the extent of $50 extra for every volunteer joining a regiment from the City. The ordinance making this appropriation was passed yesterday. Whether this $50 is a retrospective bounty, and includes those who have heretofore enlisted, is not stated. Should it be confined to those who enlist only after the date of the passage of the ordinance, some dissatisfaction must be expected from the older volunteers. Besides these public bounties, extra bounties are constantly being offered from private sources to special regiments. There was a larger number of volunteers than usual gathering all day long yesterday at the United States mustering office in White-street. Dr. MOTT and his two assistants, the medical officers there, had scarcely a moment’s leisure from morning until late in the afternoon, and Capt. LARNED and Lieut. KENNSTON had as much as they could do mustering in the men the doctors had passed. The examining and mustering officers at the encampments of the new regiments also had a busy time of it, and Dr. THOMSON, whose particular duty it is to inspect candidates for the State bounty who join old regiments, was not allowed much leisure. Several hundred men altogether were enrolled. ADJUTANT-GENERAL’S OFFICE, ALBANY, Sept. 1, 1862. 1. Information having been given that books for the new enrollment, provided in paragraph two of General Orders No. 67, current series, sent from this Department over a Meek ago, and addressed to the Supervisors of the town, except in the case of a few counties where they were collectively addressed to the Sheriff, have not, in some instances been received, it is requested that the intelligence of the non-reception of these books shall in every case be communicated to this Department. 2. Enrolling officers are reminded that it is their duty to enroll the name of every man between the ages of 13 and 45, who is not visibly and permanently disabled, noting the reason alleged where claims of exemption are made. The decision of such claims devolves on the Commissioners to be appointed, for each county. 3. In cases where either of the citizens appointed by the Government to aid the Supervisors, Assessors, or Aldermen in perfecting the enrollment is unable, for any reason whatever, to serve, the Supervisor is requested to transmit the information at once to the Chairman or Secretary of the Senatorial District Committee; the notification to this Department with the recommendation to fill the place should proceed front the Committee and ought to be made without delay. The Committee on Enlistments of the Sixth Senatorial District had a meeting yesterday afternoon, PETER COOPER, Esq., in the chair. A resolution offered by Mr. WESTMORE was adopted, directing the presentation to Col. GURNEY’s regiment (the One Hundred and Twenty-seventh New-York Volunteers) of a flag to be emblazoned with the State arms and the names of the Committee. Ex-Gov. HAMILTON FISH, and Messrs. WASHINGTON SMITH, KELLY, and PETER COOPER were appointed a Special Committee to have charge of the matter. A donation of $500 from Mr. JOHN HAGGERTY, presented through Mr. HOAGLAND, was received and a suitable vote of thanks returned. Mr. HOAGLAND also handed in $500 more, contributed by various citizens of the Ninth Ward. A sum of $100 was appropriated for extra bounties to men joining the Ira Harris Light Cavalry. Further general business was transacted, when the Committee adjourned until next Thursday. Damian, I recently discovered that Austin O Plunkett was the person who compiled this list. It is done in his handwriting. The characters matching his penmanship and his signature on a document being the same as that on the list. That is a great discovery! Do you have anything else relating to him? We must do another one in this series soon.